Late last year, Lee Wilson, Senior Access Consultant with Philip Chun Access traveled to Shanghai, China to present to the Arup fire engineering team. The presentation was titled ‘Universal Design & Safer Evacuations for All’. Universal design concepts in terms of emergency planning were discussed and it was outlined how to provide a safer building by considering the abilities of all occupants during an emergency evacuation. Also discussed was an identified ‘gap’ in Australian legislation which potentially exposes a proportion of society to a risk every time they enter a public building or workplace if their needs are not considered by building management. By considering universal design, each individual’s requirements and developing better emergency plans we can provide a safer built environment. What are the emerging risk factors? How to plan for emergencies? What are Personal & Group Emergency Evacuation Plans? What do these plans need to include? How can emergency equipment and warning systems be improved? When and how the recent editions of the building codes have been amended to improve the egress provisions for people with disability. What is a refuge area and what needs to be available inside this space? A particular topic of discussions with the fire engineering team was how refuge areas are designed and provided in tall buildings. For example, the China National Fire code requires dedicated refuge floors in all buildings over 100m in height, that then need to be distributed not greater than 50m apart within the building. For more information on universal design in terms of emergency planning and building designs please contact our office. The Livable Housing Design (LHD) Guidelines have been developed to assist the residential building, property industry and governments better understand how to incorporate easy living features into new housing design and construction. The substantial redevelopment or refurbishment of an existing building. The conversion of an existing building to a residential building. In the 4th edition, there are now 7 'Core Design Elements', a reduction from 8 in the 3rd The Element removed is ‘A continuous handrail on one side of any stairway where there is a rise of more than one metre' as this is included in Core Design Element 8 (stairways). In the 3rd edition, there were also 16 'Livable Housing Design Elements'. This has been reduced to 15 elements in the 4th edition. This is reflected in the Table of Contents, with the removal of the car parking element (Element 3 in the 3rd edition). Element 1 'Dwelling access' now includes these car parking requirements, including sizes and vertical clearances above the car parking space. It is important to note that the Guidelines no longer includes the requirement for Class 2 dwellings to have accessible parking spaces as per Australian Standard AS/NZS 2890.6 (2009). Element 5 ‘Shower’ now requires hobless showers to comply with AS3740, Figure 3.6. Element 7 'Reinforcement of bathroom & toilet walls' has simplified the text in the Silver Level and removed the commentary on inspection and verification of as-built works. Element 9 'Laundry space' has clarified the commentary around the continuation of floor finishes under laundry cabinets (Gold Level) and the clearances required in front of laundry appliances (Platinum Level). Element 10 'Ground (or entry level) bedroom space' has removed the prescriptive bed and room sizes in the Platinum Level and simplified this by assuming a queen bed size. For NSW projects, it is important to note that the State Environmental Planning Policy No. 65 – ‘Design Quality of Residential Flat Development for residential apartment design (SEPP 65) Objective 4Q-1 of Part 4 of the Apartment Design Guide’, requires Universal Design features to be included in the apartment design to promote flexible housing for all community members. The design guidance for this objective is for developments to achieve a benchmark of 20% of the total apartments to incorporate the Livable Housing Guideline’s silver level universal design features. For more information on the Guidelines please contact our offices. New guidelines relating to access in retail spaces are now available, which provide retail business owners, shopping centre owners and managers, building designers and builders with an understanding of how to make the shopping experience more independent, pleasurable and dignified for all people, including those with a disability. This includes providing an accessible experience in all retail spaces that considers universal design principles and removes not only architectural barriers but attitudinal barriers as well. Philip Chun’s Access team assisted the Australian Network on Disability to develop the new Design for Dignity Retail Guidelines. ABS research conducted in 2015 found many people with a disability have experienced unfair treatment in public settings and many now avoid going to shops, bars, restaurants, and cafés. In fact, 8.6 per cent of people with a disability surveyed felt that they had been discriminated against in previous 12 months. The Disability Discrimination Act 1992 (the DDA) requires that access to premises, goods and services is free from discrimination. In 2011, the Building Code of Australia was amended to ensure that the physical built environment is accessible and people are generally able to access business premises. However, the DDA requirements also extend beyond the physical aspects of the building and this is where the guidelines help. They provide some simple practical steps that can be taken to improve access, therefore enabling a more independent and enjoyable shopping experience for people with a disability. From entering the premises, moving around a retail space, customer service and making purchases at the point of sale. The guidelines also consider emergency situations and how to help people out of premises during an emergency. Society now expects that all people regardless of their abilities will have an inclusive experience when they shop for food, fashion or groceries, do their banking, pay bills at the post office or just want to have a coffee with friends in the local café. Good access is good for business and there is a great benefit in businesses providing an environment for social interaction and engagement. Philip Chun Access was pleased to participate in reviewing the document and provide advice and assistance to finalise the guidelines. 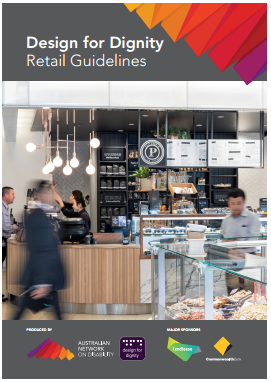 A copy of the Design for Dignity Retail Guidelines can be viewed online at http://www.and.org.au/DFD/index.html or downloaded as a PDF document. ‘Destination control systems’ or ‘Destination-oriented lift systems’ are highly desirable due to their efficiency. When people arrive at a lift lobby they first select their desired destination floor, the system then calculates the most efficient use of the lifts and allocates the most appropriate lift car to reach their destination. Benefits of these systems include efficient use of resources and reduced travel times as a passenger will likely experience fewer stops along their trip. An added benefit is that many systems can increase the dwell time so that doors remain open longer for people with mobility limitations, providing greater time to move into the lift. They also ensure that adequate space can be maintained within the lift car when people select the accessible mode while entering their destination. This is important for wheelchair users, people with assistance, animals who need a little more space, and those with a vision impairment who might be unfamiliar with their surroundings. These lifts can meet the National Construction Code (NCC) requirements by meeting the relevant ‘performance requirements’ as a ‘performance solution’. The building code is a performance-based document, meaning that compliance can be achieved through a prescriptive path (i.e. your typical lift installation with conventional lift landing and lift car control buttons); or by a performance-based solution, that might include the use of a Destination control system. However, any such system accepted under a ‘performance solution’ must be equal to, or better than the prescriptive solution. The Philip Chun Access team is experienced in advising clients on the implementation of appropriate lift systems that meet NCC requirements. For more information on NCC requirements please visit the ABCB website.